Living a Fit and Full Life: Go on a Journey with Finding Gobi: Young Reader's Edition: The True Story of One Little Dog's Big Journey! 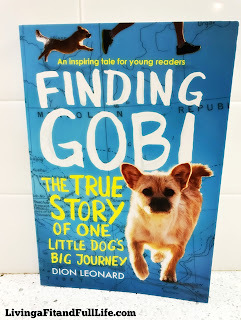 Go on a Journey with Finding Gobi: Young Reader's Edition: The True Story of One Little Dog's Big Journey! Finding Gobi: The True Story of One Little Dog's Big Journey is the incredible true story of Dion Leonard, an athlete who was befriended by a stray dog while running an ultramarathon through the Gobi Desert. Named for the desert in which he found her, Gobi became Dion’s closest companion for 77 miles of the 155-mile race across China. The scrappy little pup ran mile after mile alongside Dion, through treacherous conditions and across raging rivers. He let her sleep in his tent and share his food, and eventually, his focus shifted from winning to the newfound friendship he and Gobi shared. Join the almost too-good-to-be-true story of hope, friendship, and beating incredible odds in Finding Gobi: The True Story of One Little Dog's Big Journey by Dion Leonard. by Aaron Rosenberg is the perfect book to inspire kids that they will absolutely enjoy reading! 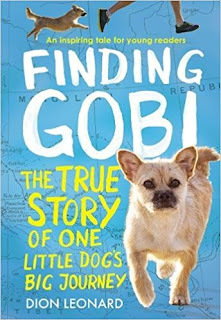 You can find Finding Gobi: Young Reader's Edition: The True Story of One Little Dog's Big Journey on Amazon, Barnes and Noble and at other bookstores.